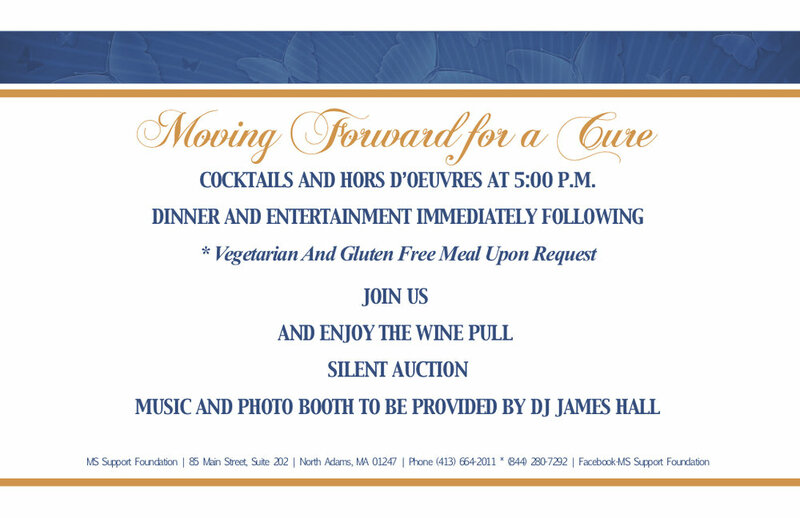 You are invited to our 11th Annual Gala! We are a non-profit organization investing in programs designed to ensure individuals with MS can live their life to the fullest. We reach out to individuals with MS by building a multimedia - public resource center, offering educational programs, group and individual support, maintaining a list of volunteers, and hosting an up-to-date website. We support and provide funding for educational efforts to identify and assist in early prevention and treatment of cognitive deficits and associated disability in MS through research. We host a support group that meets every month to discuss issues and learn more about this debilitating disease. "State Sen. Adam Hinds, D-Pittsfield, was the master of ceremonies and presented board President Wende Carver and Executive Director Judy Bombardier with a resolution from the State Senate congratulating the MS Foundation on its 10 years of service and support to MS patients and families."